Cancelled DA3 category micro ships contained the specifications for the carrier, a length of no more than 20 studs. 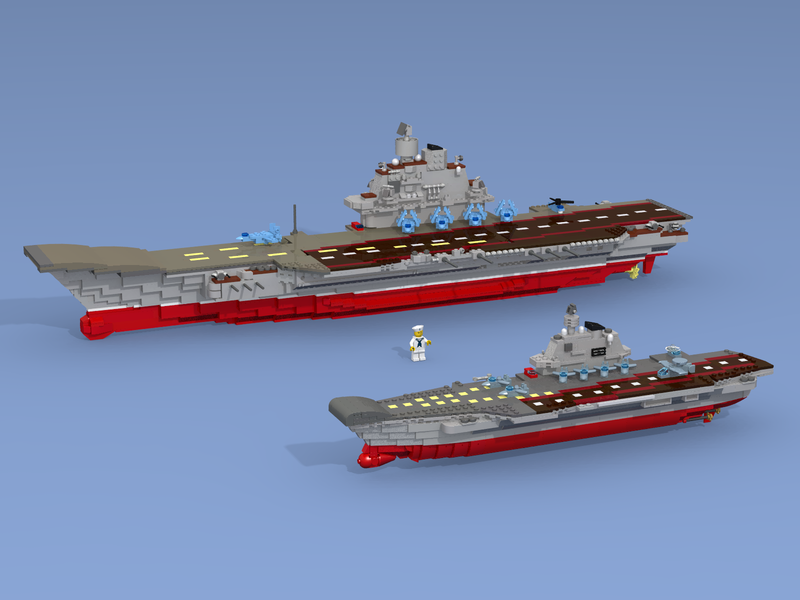 I decided to build an aircraft carrier of the minimum possible size, so that it had a real prototype and planes that can be seen. )) Of course there were much more than 20 studs, specifically - about 60. CV "Admiral Kuznetsov", the first and only Russian aircraft carrier. Carries heavy deck fighter Su-33 and Mig-29k, trainning attack aircraft Su-25UTG, as well as various modifications of helicopters Ka-27 - anti-submarine, rescue and AWACS. The design of Admiral Kuznetsov-class implies a mission different from that of the United States Navy's carriers. The term used by her builders to describe the Russian ships is tyazholyy avianesushchiy kreyser (TAVKR) � "heavy aircraft-carrying cruiser" � intended to support and defend strategic missile-carrying submarines, surface ships, and naval missile-carrying aircraft of the Russian Navy. For take-off of fixed wing aircraft, Admiral Kuznetsov uses a ski-jump at the end of her bow. On take-off aircraft accelerate toward and up the ski-jump using their afterburners. This results in the aircraft leaving the deck at a higher angle and elevation than on an aircraft carrier with a flat deck and catapults. The ski-jump take-off is less demanding on the pilot, since the acceleration is lower, but results in a clearance speed of only 120�140 km/h (75�85 mph) requiring an aircraft design which will not stall at those speeds. The "cruiser" role is facilitated by Admiral Kuznetsov's complement of 12 long-range surface-to-surface anti-ship P-700 Granit (NATO reporting name: Shipwreck) cruise missiles. As a result, this armament is the basis for the ship's Russian type designator of "heavy aircraft-carrying missile cruiser". The aircraft carrier is "impenetrable" system of self-defense - 8 12-barrel CIWS "Kortik", 6 6-barrel gun mounts AK-630, 192 VLS SAM "Kinzhal", as well as an active anti-torpedo system "Udav" with 2 launchers. With the figure of a seaman for a scale. The construction took a little more than 600 (786 - full hull version) bricks. Quoting Henrik Jensen Sorry I haven`t commented on this before, I thought I did, but just realized the smaller scale now. Really amazing to see the amount of details you have put into this miniature ship, Excellent work! Sorry I haven`t commented on this before, I thought I did, but just realized the smaller scale now. Really amazing to see the amount of details you have put into this miniature ship, Excellent work! Quoting Oran Cruzen Excellent Sir! Quoting Blaine R. Another accurate rendition! Quoting Kurt's MOCs This looks amazing! All of the details and proportions are correct and it is built with a subtlety and ease that belies its genius! Well done! Thank You, Kurt! Glad you liked it! This looks amazing! All of the details and proportions are correct and it is built with a subtlety and ease that belies its genius! Well done! Quoting Daniel Ringuette Wow! You managed to pack in a ton of detail at this scale! Terrific job! Wow! You managed to pack in a ton of detail at this scale! Terrific job! Quoting Locutus 666 Excellent done. The skyjump remains as a big competition with Lego parts. Yes, my decision is more like an English ramp at the aircraft carrier Hermes than the original. But I chose the variant that will look better )) Thank You, Locutus! Excellent done. The skyjump remains as a big competition with Lego parts. Quoting El Barto ! Nifty micro! Go Capitols! Different Kuznetsov? Nifty micro! Go Capitols! Different Kuznetsov? Woof! What a beast! Good work, as always. The deck markings are very well done! Quoting Patrick Boyle Woof! What a beast! Good work, as always. The deck markings are very well done! Quoting Gabor Pauler I really enjoyed the bow solution. Quoting Fell Skyhawk Amazing as always. Quoting Clayton Marchetti I agree with Nick. Is all there. Magnificent! Love the aircraft by the way. I really enjoyed the bow hump solution. I agree with Nick. Is all there. Magnificent! Love the aircraft by the way. Quoting Werewolff Studios Wow! Mighty impressive work here Seaman! If only the Cat's could make use of it :) Seriously though, a lot of awesome curves and NPU at play here! Wow! Mighty impressive work here Seaman! If only the Cat's could make use of it :) Seriously though, a lot of awesome curves and NPU at play here! Quoting Master Shifu Leo J AWACS plane for the icing! Yes, small airplanes for aircraft carrier model is the most important element. Without them, it will look like a floating box ) Thank You, Master Shifu! AWACS plane for the icing! Quoting Nick Barrett It loses remarkably little compared to the bigger model, a thing like this would have been a huge asset to DA3. Thank You, Nick! This for souls, not for DA3 )) I wanted to build this ship a long time ago. As soon as I debug its design, I will build it from real bricks. It loses remarkably little compared to the bigger model, a thing like this would have been a huge asset to DA3. Quoting Mark B. Awesome work. The details and hull shaping are excellent. At some point, I'd love to build one of the British ski-jump carriers, but probably at a somewhat larger scale. Too bad there isn't a DA3 category that this MOC would fit into, at least not yet. I'd love to build for such a category. Awesome work. The details and hull shaping are excellent. At some point, I'd love to build one of the British ski-jump carriers, but probably at a somewhat larger scale. Too bad there isn't a DA3 category that this MOC would fit into, at least not yet. I'd love to build for such a category. Quoting Doug Hughes Fantastic work! You are so good at distilling out just the right details at any scale! What part did you use by the way for the wings of the awacs aircraft? Quoting Ron L. Mitchell As an American, I am used to the flat launch deck. The Continental use of a ramp at the end of the launch deck always looked odd! I understand the idea behind it, but question the overall effectiveness as opposed to the increased maintenance issues on the aircraft. Your thoughts SP? Catapult is much more effective. Just still anywhere except the US do not know how to do them )) European ramp - for STOL aircraft. Quoting Michiel Norp Hip hip Hurrah 3x, to the admiral of naval builds. Quoting Zach Sweigart What a beauty! Fantastic work! You are so good at distilling out just the right details at any scale! What part did you use by the way for the wings of the awacs aircraft? As an American, I am used to the flat launch deck. The Continental use of a ramp at the end of the launch deck always looked odd! I understand the idea behind it, but question the overall effectiveness as opposed to the increased maintenance issues on the aircraft. Your thoughts SP? Hip hip Hurrah 3x, to the admiral of naval builds. Quoting BATOH rossi it's always beautiful on any scale! now you have to do it even in 1: 1! it's always beautiful on any scale! now you have to do it even in 1: 1!